What is your favorite dessert? Is it a cake or maybe it is an ice cream? 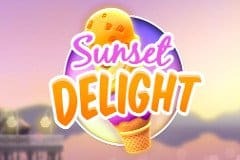 In the new slot Sunset Delight you will definitely find out that you’re craving for some sweet ice cream and can’t wait for the next summer to come. Sunset Delight is a game that is inspired by such a small thing as ice cream. Although food theme is often used in slot designs, there aren’t that many slots that are particularly dedicated for ice creams. This slot is a great example of a game that is so simple and which inspiration can be found in most people refrigerators’, yet it looks so unusual and beautiful. Not only that the game has an interesting theme, but the layouts and reels look fun, as they are designed as ice cream cones. It is really nice to see that each and every symbol in this game is thought through and there’s nothing missing and nothing to add. The ice creams are in several colors and their look is very organic with the theme. The design is such an eye candy that after playing this game no one can resist an ice cream. Sunset Delight is a new game that is powered and released by Thunderkick software. They are a trustful and beloved provider that has a decent amount of slot games in their collection and all of their games really stand out in terms of design and technical structure. So playing their games is always fun from a visual point of view. Although Sunset Delight is a game that has really unique looks, it is very simple to play it. With its 3 reels and 3 rows, the game allows players to bet from $0.10 and up to $100 per spin, which makes it a great fit for both low and high rollers. The game has an auto play option and in order to play, player needs to choose one of the available bets. Minimalism and simplicity are the key words to describe this games’ bonus features. When it comes to online slots, most players prefer a free spins bonus compared to any other, like a pick bonus. Luckily Sunset Delight offers only one bonus feature and it is free spins. We have mixed feelings when it comes to this bonus feature. First of all, in order to receive the free spins, the player needs to get 3 scatter symbols in the base game. For that there’s a 5 free spin reward. The good thing about this is that when the free spins start if a player receives a scatter symbol it adds one extra free spin and takes you one step higher on the ladder. The higher you are, the higher the multiplier for your winning is, as there is a multiplier reel that increases with every extra scatter. If you are very lucky, you can get up to a 100x multiplier and the wild symbol help you get decent winning combinations while climbing up. But the reason we have mixed emotions is because only 5 free spins is a really small amount and, as possible as it is to get scatter symbols and climb up, it is also possible to have 5 empty spins. Also even though there is a wild multiplier reel, the free spins start at a 1x multiplier. Sunset Delight is a great game from many aspects and it is a game where players can expect nice winnings of 100x bet and more, but that being said, the maximum win is capped at only 413x players bet. Sunset Delight is a great game that has simplistic elements in its’ design and features, but the simplicity works in favor for the game as there is nothing that doesn’t fit. The color scheme is really beautiful and in many ways it actually reminds us of a sunset, so it feels like Thunderkick has combined things that people love the most, delicious desserts, sunset and a positive atmosphere. The bonus feature is quite typical to the way it usually is from Thunderkick, where you can earn extra free spins and multipliers by collecting extra scatter symbols. In that way you can never know what to expect and it keeps players excited. The free spins bonus game can end up with nice winnings, but at the same time it can be hard to get the extra scatters on the reels. But with the simplicity and sophistication the slot has, it is also affordable and you can bet as little as $0.10, so because of that we think it is worth trying.